I don't always struggle with sleep, but due to the increased stress in my life over the past few months, my sleep has started to suffer. I am not the kind of person that can power through the day on 6 hours of sleep. I am an 8+ hours of sleep a night kind of girl. So, when I started waking up in the middle of the night for hours, I had to find a way to make that stop ASAP. Enter essential oils. There are so many oils out there that are good for sleep, but the trick is finding the one(s) that work best with your body and help send you into dreamland. Since everyone's body chemistry is a little different, it can take some time to find what works for you, but once you find the magical combo, your life will never be the same! I am a woman of science (nurse practitioner and science nerd) so when I first started using essential oils for sleep, I was skeptical. I truly believed that their only function was to smell good, but I was desperate enough to try anything. So, the first night I tried them I slathered my feet in lavender oil and got into bed. Next thing I knew it was time to get up. I figured it was a fluke and that I was just at the point of exhaustion and would have slept well no matter what. But then, for an entire week I reproduced the same results (you may or may not remember from high school science class that the key to a successful and relevant scientific study is that the results are reproducible). That was enough for me. Now, I know my body well enough to know when I'm not going to be able to sleep because of stress or because my mind is racing vs. when I just can't sleep due to something else. Knowing this has allowed me to pick specific oils to put in my diffuser at night to help combat those issues. Other nights, when I don't feel stressed, I stick with my generic sleep blend to simply support restful sleep. Here are some essential oils that can help you sleep. I have linked to scientific studies (not studies sponsored by essential oil companies, but actual scientific studies) where I was able to find them. Remember that quality matters too. Grocery store brand essential oils are often synthetic or contaminated with chemicals that are not safe, so it is extremely important to find a high quality brand that is safe and potent (if you want to know more about the brand that I use, shoot me an email and we can chat). Lavender: I’m sure you aren’t surprised to see lavender at the top of this list. Most people know that lavender is good for relaxation. However, what most people don’t know is that its effectiveness has actually been studied. Several studies done in the ICU have shown that lavender increases sleep quality and anxious feelings of hospitalized patients. This study too. And lavender was found to help with both sleeplessness and feelings of sadness/poor mood in female college students. Another study found that lavender decreased agitation in older adults suffering from dementia. So while lavender might seem like something that just smells nice, it can pack a pretty big (and scientific) punch when it comes to sleep! Vetiver: Vetiver essential oil is distilled from the roots of the plant. It’s earthy smelling, and it has quickly turned into my go to oil when I need to help my brain shut off at night. It is not my favorite smelling oil and it took me some time to get used it, so you might want to start by mixing it with a lighter oil such as lavender or roman chamomile. Roman Chamomile: Roman Chamomile oil is known for its calming, soothing, and relaxing properties (much like when your mom or grandma told you to drink chamomile tea at bedtime to help you sleep). It is perfect for anytime you need to create a peaceful atmosphere. Ylang Ylang: Ylang ylang oil is a great choice if you are looking to improve the quality of your sleep. I have not used it yet, but it's near the top of my list for new oils to try. A study done on volunteers found that ylang ylang increased calmness. Bergamot: Bergamot is a citrus fruit and the oil is cold-pressed from the rind or peel (it's one of the ingredients in Earl Gray tea). Most citrus oils (like grapefruit or wild orange) have a stimulating effect, but bergamot is different. It’s bright but calming at the same time. A study done on healthy individuals found that listening to soft music and/or inhaling bergamot aroma were effective methods of relaxation, as indicated by a shift of autonomic nervous system balance towards parasympathetic (the "rest and digest" branch of your nervous system). Sandalwood: I love the oils that remind me of the woods, and sandalwood is no exception. It is one of the more expensive oils, but a little bit goes a long way, so it’s one I definitely keep around at all times! Cedarwood: I love this oil because it also reminds me of the woods. I like to use it when I need to calm down after a busy day, or recenter and refocus myself. I use it topically or in the diffuser. My current favorite blend for balancing and refocusing myself is wild orange, frankincense, and cedarwood. Topical Use: Applying oil topically can be a wonderful way to experience oils. I generally rub oils on the back of my neck or on the bottoms of my feet before bed. If you are new to using oils or have sensitive skin, you should dilute them with a vegetable oil before applying them to your skin. Almond oil, olive oil, or coconut oil are all great to use when diluting essential oils. Aromatic Use: My secret essential oil weapon is my diffuser. I ordered mine with my starter kit of oils, but you can get them separately if you already have oils. It’s easy to add just a few drops of any of oils to a bit of water in your essential oil diffuser and set it by your bedside. You'll be experiencing the benefits of these oils while you sleep (and it only takes about one minute to set up!). Sleep is SO important to our overall health and well-being, if you aren’t sleeping well, the rest of your health can suffer. But feeling tired isn’t always due to lack of sleep, there are many common health conditions that contribute to feeling worn down and tired all the time. 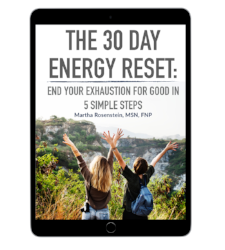 Check out The 30 Day Energy Reset ebook to learn what else might be causing your fatigue and what to do about it! This book also includes a ton of practical and easy to implement tips to improve your sleep! Are you ready to beat fatigue and end your exhaustion for good? Get your copy of The 30 Day Energy Reset here!